This 55-Inch Pro Series SunBriteTV brings Extended Solar Tolerance (EST) technology to your backyard and allows you to view your TV in direct sunlight. This technology protects the TV screen from isotropic blackout, which is an occurrence when TV monitors are placed in direct sunlight, allowing for perfect 1080p HD viewing anywhere. The protective, tempered glass protects the LED back-lit LCD screen from potential damage, making it the perfect TV for your active areas such as a pool, where volleyballs or Frisbees are tossed around. The powder-coated aluminum exterior is designed to defend inner components from rain, snow, dust, insects, humidity and salt air. The TV will withstand sub-freezing temperatures of -40 degrees and temperatures up to 122 degrees Fahrenheit. 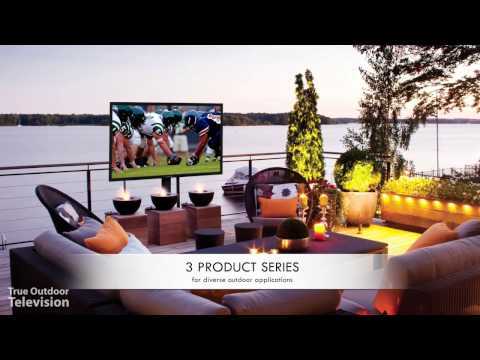 All SunBriteTVs are designed for permanent outdoor installation and endless days of entertainment. This SunBriteTV Pro Series HDTV includes a 20 watt weatherproof detachable speaker bar and weatherproof remote control with lock-out function. VESA compatible. SunBriteTV products include a two-year parts and labor limited warranty for residential installations. This warranty covers failures due to defects in material or workmanship that occur during normal use. 55" 55" 54 3/5" 54 3/5"